If not already installed, download and install Google earth from the Google Earth Download page. Hint: To speed up the download, exclude Google Chrome by unchecking the checkboxes. Google Earth will be used to view satellite and land contour images of your location. You'll be able to view the hills and mountains and plot a line of site path between a marker at your location to a marker at the cell tower location. Configure to display Latitude and Longitude in Decimal Degrees. Stop GE from automatically tilting the view as it zooms. 1.2 Drop a marker at your location. 2 - Drop a marker near your location and drag it to the exact position your antenna will me mounted. Press [Add], [Placemark]. , Name your Placemarker for future reference. 3 - Highlight the Coordinates without the "°" and to copy to the notes box, as shown above. This can make for easy copy/paste in a later step. 4 - Highlight the [Lat, Long] Coordinates and to copy. see 3 in the above image. 1.3 Leave Google Earth open. You'll be using this later, so minimize or re-size without closing it. "Save my Places" on the "File, Save" menu of Google Earth. 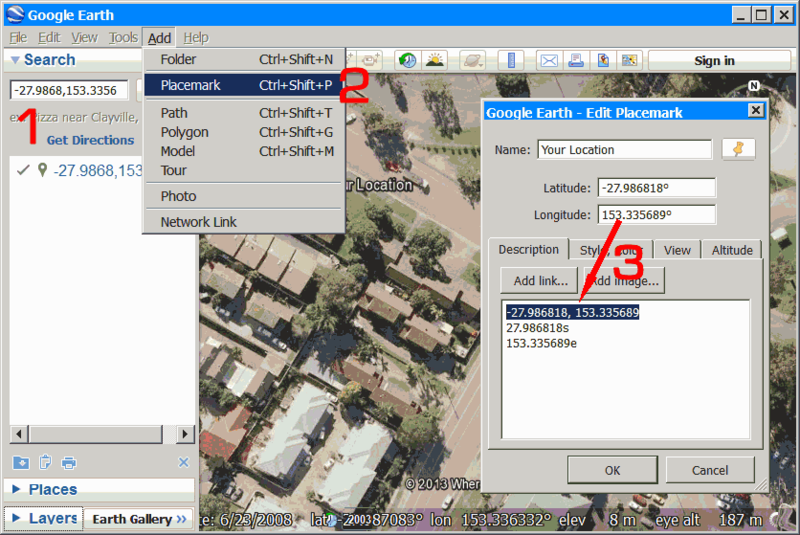 This saves all your work in Google Earth, so if your PC or Google Earth crashes while your doing this research, you wont need to start all over again. The Site Coordinates shown in the bubble are in AGD66 datum format whereas the coordinates accepted by Google Earth use GDA94/WGS84. The difference between these datum types places ADG66 about 200m south east of WGS84. Luckily the KML link of the Site Bubble converts the coordinates and opens the location in Google Earth using the correct datum type. It is very important to locate the exact position of both the tower and your location because a difference of 10m in position might produce a significant difference in signal strength result, depending on the terrain. Please remember to Save your places at this point.